How cute is this… musical moves, singing in rain with an umbrella? 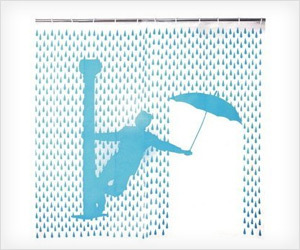 Kikkerland Themed Shower Curtain “Singing in the Rain” takes the feel good factor to a new level. It is inspired from old classical movie musical Singin’ in the Rain. Designed by Jan Habraken, with this you can pretend to be Gene Kelly singin’ and dancin’ in the rain.